Everybody knows that a mistake in sport is only a mistake if you subsequently lose. If you take the week off training and win, it was a masterstroke because you left your team refreshed. Take the week off and lose, you just weren’t hungry enough. 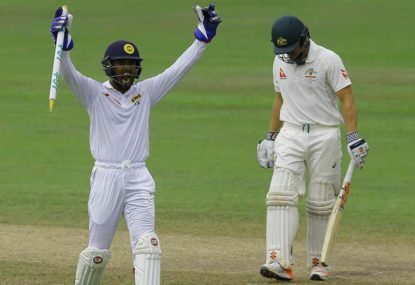 So, let’s examine the causes of Australia’s two Test defeats in Sri Lanka, according to my enlightening correspondence from the last two weeks. Of course. The Big Bash. The IPL. All that fast scoring and lack of discipline means that modern batsmen don’t have the patience, the concentration, and they can’t stop themselves getting out to rash shots. Except… barely anyone has got out to aggressive shots. Steve Smith in Kandy, trying to put pressure on the spinners, and Peter Nevill before his second-dig stonewall. Then Mitch Marsh in Galle, trying to score a few quick runs for the last wicket. David Warner in particular has been sledged for being a slogger, yet top-scored for the match and was out defending twice. So was basically everyone else, foxed by the bowlers. Ten of Australia’s individual innings in Galle were ten balls or under. That’s short for T20. Only two players in the match faced more than 50. That’s short for one-dayers. They didn’t lose concentration, because no one had enough time to. You know what, you’re right. You’re right that modern Test pitches in Australia are often garbage. Like the WACA last year where a catch didn’t carry to gully in about the second over, and halfway through a spell Mitchell Johnson spontaneously retired. But even if our tracks have life, they’re not Asian decks. The SCG hasn’t spun that much in years. Having the range of characteristics they once had would be good for making batsmen adaptable, but that won’t affect Asian tours unless we turn all our wickets into dustbowls. I did like the guy who said we need to “put some life into our pitchers” – they’re called bowlers, mate, and we don’t pick dead ones. Unfortunately, Australian batsmen can’t pick Sri Lanka’s live ones either. 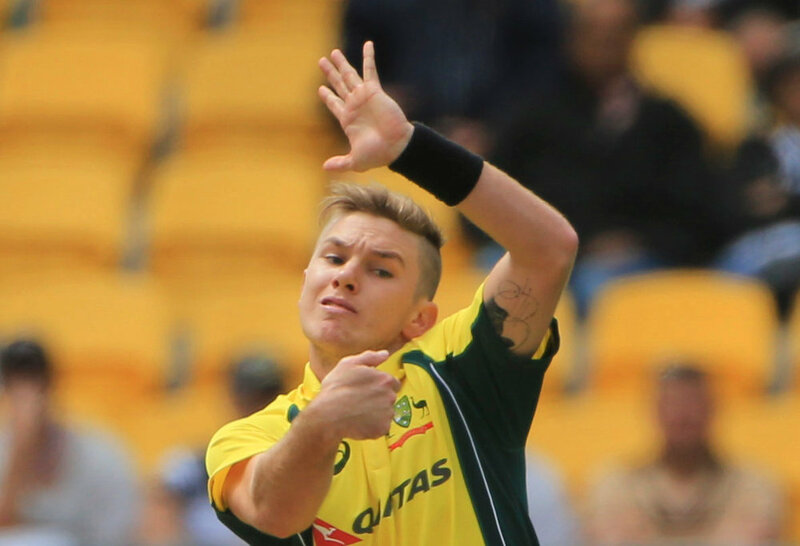 Adam Zampa is a leg-spinner. We all know that every leg-spinner take wickets all the time. We remember one or two who used to do that. On YouTube they basically do it every ball. Anyway, who the hell is Jon Holland? We didn’t see him on TV during the last home summer, so he can’t be any good. The only trouble is that Zampa is a limited-overs bowler. In short-form cricket, he needs to bowl a dot ball. He’s very good at it. When he bowls more than a few, someone tries to slog him over midwicket. Then he gets them out. In a short game, if he gets worked for four singles an over, he’s won. In a Test match, if he gets worked for three singles an over, he’s lost. And in a Test match, he has to keep doing it past 10 overs, past 20, sometimes past 50. He gets tired and he bowls worse, then batsmen pick him off. It doesn’t work. He may yet become a good long-form bowler, but currently, he’s just a young player with a long-form bowling average of 50. A Test bowler needs weapons to attack a batsman, not shields to defend. Xavier Doherty was a very good limited-overs bowler too. He played a couple of Tests. Google the scorecards. What’s that? 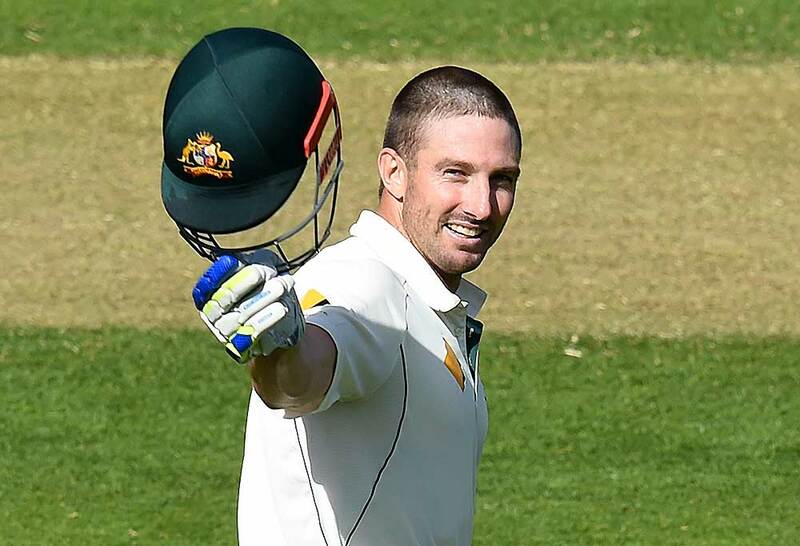 Shaun Marsh made a hundred on debut in Colombo on the last tour? Yes, he did. Nathan Lyon took five-for on debut at Galle in 2011, then got flogged like a bad insurance policy at the same ground last week. Nathan Lyon is a proven cricketer with a good record. Spot the difference. I could argue that the SSC in Colombo is a road, but I don’t like that argument. I’m sure his hundred was good and he played well, because he very occasionally does, but the rest of the time he doesn’t. Marsh has three Test hundreds in 30 innings, as well as 18 scores under 20. He has 12 hundreds for Western Australia in sixteen years of playing first-class cricket. To say you should pick Marsh at a ground because he got a hundred there five years ago is like saying you should quit your job and live in the bus station because one night you found 20 bucks there. Beyond individuals, there is talk that we need to pick an entire specialist squad for the subcontinent. “You are a product of what you grow up on. We need to pick batsmen for the conditions LIKE WE DO BOWLERS,” said one fellow (emphasis clearly his). Except our bowlers can’t bowl in the conditions either, aside from Mitchell Starc, who we also pick everywhere else. And if the issue is that you’re the product of what you grow up on, we don’t have players who’ve grown up in foreign conditions. That’s pretty central to the definition of the word ‘foreign’. What we have done is pick the players who’ve been performing best recently, and who’ve all made runs or taken wickets in their last few games. If we had a few champions of the turning track waiting in the wings then it would make sense to swap them out. But who could you pick based on more than hunch and hope? Admittedly, we could just go overseas and hire 11 guys who never quite made it into their own national teams – we already started that process with Fawad Ahmed. But Fuzz hasn’t yet been a resounding success, and the best players in other countries are generally already playing for them. If we just go and recruit 11 players from India who are not the best in India, they’ll probably lose to the 11 who are. Admittedly, the recruits might have a better chance of winning than our current lot, but even if they did, it would ring a little hollow as an Australian sporting triumph. You know, given that whole premise where people from one place play people from another. Yes, someone proposed this. I presume the gentleman in question still runs his laundry through a mangle, and sees the work of the devil in modern sanitation. Of course we should do away with the innovation that packed out the Adelaide Oval last summer with people having a really great time, made a truckload of money, and got people talking worldwide. And who wouldn’t want to bring back a 35-year-old ex-captain with busted hamstrings, a fused back, and a chip on his shoulder that Warner could use as a bat? 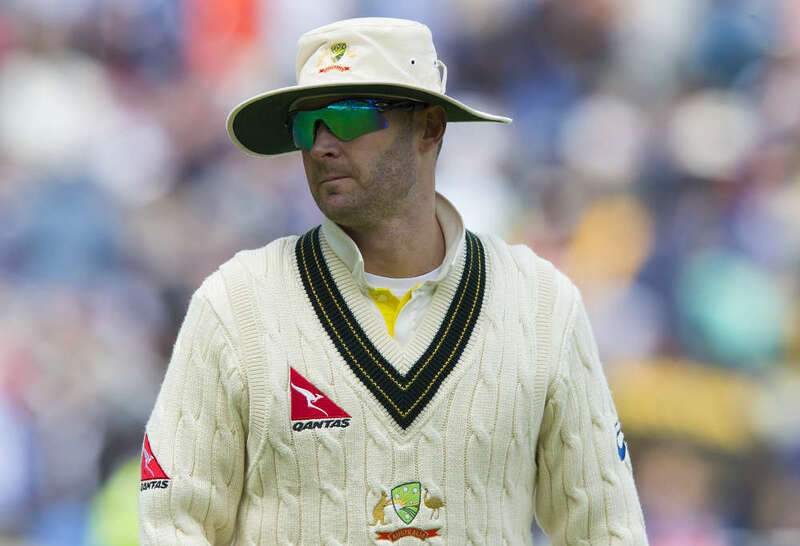 We have two more pink-ball Tests this summer, other countries are adopting the concept, the experiment is going strong, and Clarke is probably otherwise occupied staring into a lake. The problem with modern players is that they don’t have the guts. They lack the heart or the desire, determination, passion, fight… whatever. These things are great to cite because they’re completely abstract, untraceable and unquantifiable. Like Tony Abbott once said about carbon dioxide, how can you measure something you can’t see? Except you can literally freeze carbon dioxide into a brick and weigh it, which you can’t do with desire, passion, determination, heart, or guts. Ok, you can do it with heart and guts, but please don’t. I never know what to say to these arguments. No professional athlete wants to lose, or doesn’t care. Maybe some get disheartened and it affects their play. Maybe others are more resilient. But you can be as determined, steely and fiery as you like and still miss the ball. Skill can be affected by mindset, but mindset doesn’t create skill. There’s not much point speculating. It’s like the existence of God: can’t be proved or disproved, so all you can do is have a lot of arguments along the way. Self-indulgent, complacent, putting money before the game. That’s what we said when Australia didn’t have a proper warm-up match in 2014 before being crushed 2-0 by Pakistan in the Arab Emirates. This time our national team arrived in Sri Lanka weeks ahead, played practice games, employed local coaches and bowlers, went through thorough spin clinics, used local pitches, and has so far been crushed 2-0. We selected a team that had been playing well, collectively and separately. They weren’t up to the conditions and have played an opponent that was. Sometimes, no matter what you do, that might still be the result.